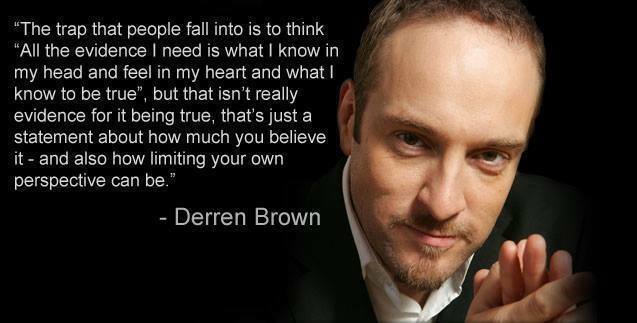 I think Derren Brown is a very clever man and I have to agree with what he says..... do you? Absolutely, of course, he's spot on! This guys TV shows are quite extraordinary, and prove just this. He is amazing, he's still my favourite illusionist by far! Indeed he is Ags. He's done a lot of research into ghosties and goulies too. He also did a fascinating series called "The Experiments". The first episode was to see if he could create a "Manchurian Candidate" to assassinate Stephen Fry. It took him about six months to successfully get the guy to the point where he happily took a gun a shot away at him (gun was loaded with blanks of course). Wow Mords, I never watched that program! Of course it is possible to create Manchurian candidates, in a way some religions do that to people. Here's the episode, it is well worth the watch. Of course it is possible to create Manchurian candidates, in a way some religions do that to people. But you are right, governments and religions do the same things.. they brainwash, they control, they tell you what to do, they give you rules for 'your benefits'...... and how the heck are we supposed to free ourselves from it? I believe truth is subjective and I also believe there may not always be a universal truth for everyone. Potatoes may taste yummy for one person and horrid to the next. Just because it tastes horrid for one person doesn't negate or invalidate the scrummy-numminess of them for the other person. I really dislike being made to feel as if I'm stupid and that's exactly what that quote has done... it comes across to me as smug and self-satisfied, oh he knows me so much better than I do and only he can see the horrible trap I'm in for believing in anything remotely unprovable. And no, I don't know him from anything else than the quote. No, K, he's not like that and it shouldn't make you feel stupid cause you are not. We should never feel ashamed or embarrassed of what we believe, but he is pointing out that those things you believe are real for you because you truly believe them in your heart, but it doesn't mean that others will also agree they are real as they do not feel them and they don't have any evidence about it. But sometimes scientific proof isn't always correct. Some things have been proven by science, so we all start believing that is the truth, until some other science comes along to disprove the first theory and coming up with a new one. Science is ever evolving, just like our world and our universe. Just because something was once set in stone, it does not mean it always will be so. The Westboro Baptist church memebers believe with 1000% convinction that God hates all homosexuals, that God wants all homosexuals to be killed and that Jesus is coming soon and will take some of us to heaven. To them that is the truth and they believe totally in their truth. Do you think it's true? and if you don't , why don't you? The Westboro are one example of a 'cult' type of religion that brainwashes it's members to believing in something that one person (or a small group of people) has dreamed up. It just shows how easily human beings can be swayed. We'd believe anything if it comes from the right source, and one that we believed was very credible, and somebody we looked up to. You are right but just because they believe in their truth with all their heart it doesn't mean it really is true. That is all Derren Brown is saying. Yes I believe they can Rogue, as we all have our own truth. We all believe in different truths. So that will make them all real? No. To me believing only makes the truth real to the believer. Many believe Earth to be only 6000 years old when evidence shows it's billions of years old. In this case their belief is just that, their own personal belief. Yes, I agree. When you have a number of those people with the same beliefs all together, its a powerful force, no matter if its real or not.